(Newser) – Jimmy Carter wants "to prevent a second Korean War," and so has offered to meet with Kim Jong Un, per a University of Georgia professor who met with the ex-US president. Park Han-shik spoke of Carter's plans to South Korea's Korea JoongAng Daily amid rising tensions between Washington and Pyongyang, the Hill reports. "Carter wants to meet with the North Korean leader and play a constructive role for peace on the Korean Peninsula as he did in 1994," says Park, who helped arrange Carter's visits to the North in 1994 and 2010. He says Carter would travel there to discuss a US-North Korea peace treaty and the "complete denuclearization of North Korea." Such a trip would require US authorization, as President Trump has banned US citizens from traveling there since last month. Carter detailed his concerns about the possibility of another Korean War in the Washington Post last week. Carter has been an effective negotiator and diplomatic mediator in the past (as Ex-president). I doubt trump would allow a Democrat take any credit for fixing the situation or even improving it. He needs to be the one to take credit and he is incapable of doing it himself. I know there are a lot of folks who don't want to hear this, but Carter was actually at least a "fair" (as in middle of the road in rankings) president. 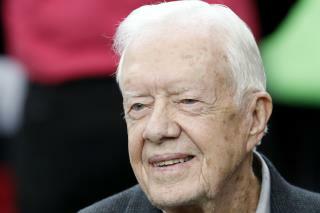 Believe it or not, in aggregate, Jimmy Carter isn't even in the "bottom 10" of US presidents. They are James Buchanan, Andrew Johnson, Franklin Pierce, Warren G. Harding, John Tyler, William Henry Harrison, Millard Fillmore, Herbert Hoover, Chester A. Arthur and Martin Van Buren (in fact, even Coolidge, Nixon, Garfield, Benjamin Harrison, Taylor, Hayes and GW Bush rank lower than Carter). See https://en.wikipedia.org/wiki/Historical_rankings_of_presidents_of_the_United_States SURPRISE, SURPRISE. Jimmy Carter may be an EX-President. I wouldn't let him touch anything. After all, he "professes to believe in little men, "little men upon the stair, little men who were not there". In short, he's a CHRISTIAN. I wish we had an 11B politician in this country. Damn few, if any, and far between. Look up 11B if you don't understand.